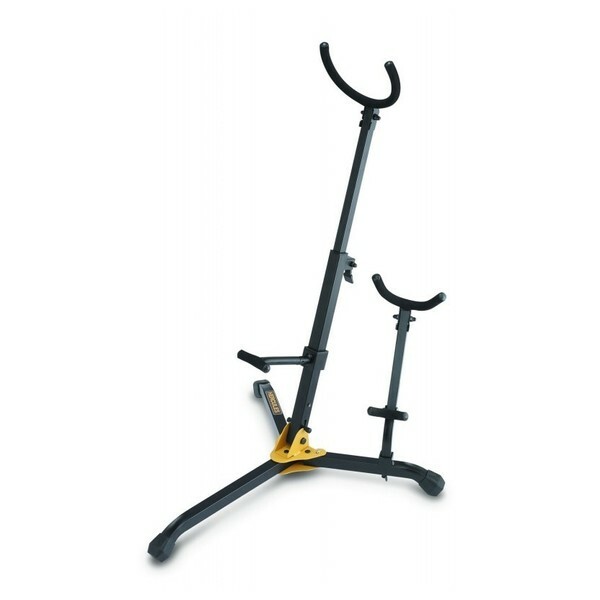 This Hercules stand caters for the gigging musician who needs to double up on baritone saxophone as well as an alto or a tenor sax. An easily collapsible and compact design with an adjustable back support provides the needs to hold two instruments with ease and safety. The Hercules stands offers prime protection for your instruments when out of their cases, while at the same time not weighing you down with a set bulky and heavy stands. The all in one baritone and alto/tenor sax stand folds away in to a compact shape and the alto sax peg completely detaches, leaving an ergonomic stand to carry around with. The support itself is uncompromised, boasting a stand that is both rugged and very strong.